Kingston’s municipal water system was proposed at Town Meeting in 1884, legislated in 1885 under “An Act to Supply the Town of Kingston with Water,” and implemented in 1886. The system officially began operations on August 10 that year. 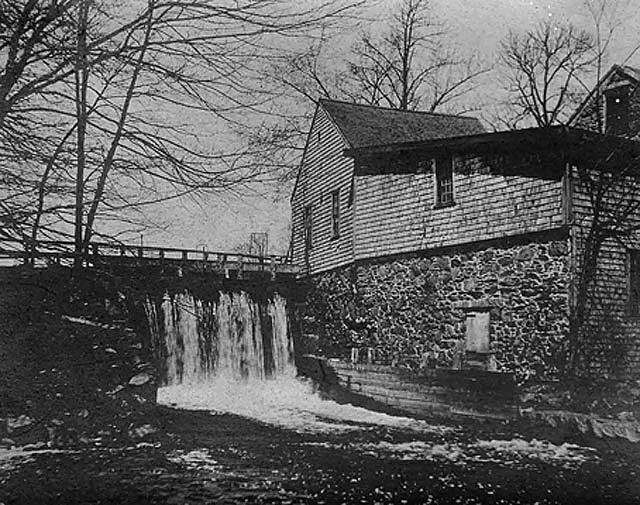 While the actual water supply came from wells, Jones River water power supplied the mains and the reservoir (see this earlier post) via “a Blake duplex power pump…capable of…228 gallons per minute…driven by a 30-inch Burnham turbine water-wheel of 17 horse power,” according to the Water Commissioners’ Report, March 1, 1887. Though the station was electrified around 1905, the system relied primarily on inexpensive and traditional water power through the 1930’s, except in times of low water or during repairs to the dam and equipment. 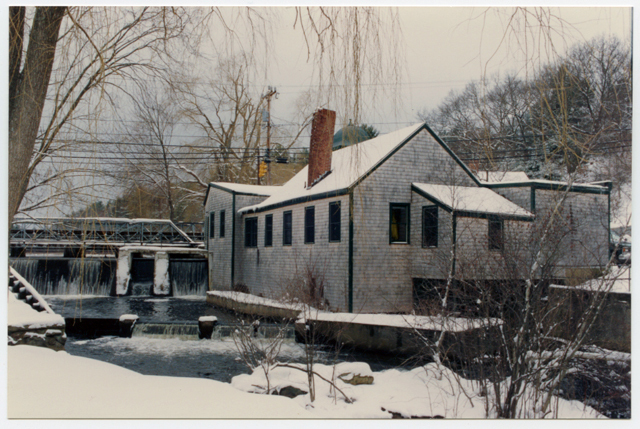 As early as 1704, the water privilege on the north bank of the Jones River at Elm Street powered industry: a grist mill was replaced by a fulling mill, which preceded a shingle mill. Finally, the Town bought the rights to the water power and built the pumping station. Here are two views from the south side of the Jones River. In the 1920’s a new concrete dam replaced the old wooden version, shown in the earlier photo. “April showers bring Mayflowers,” especially lately with all the recent rain and particularly in Massachusetts, where these fragrant little blossoms are our state flower. 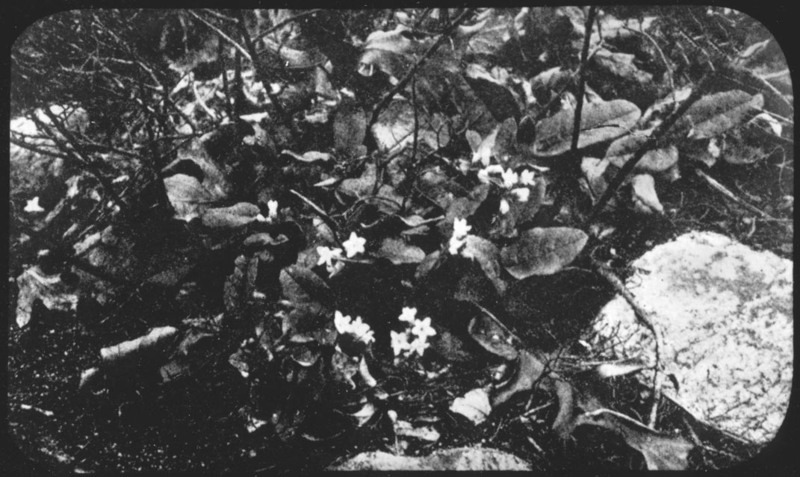 Commonly called Mayflowers, trailing arbutus or less elegantly, the gravel plant, Epigaea repens can be found hiding under pine needles and poking through fallen leaves, blooming between March and May anywhere from Newfoundland west to Michigan and from Saskatchewan south to Kentucky. The plant lies low on the ground with rust-colored hairy stems and leathery green leaves. 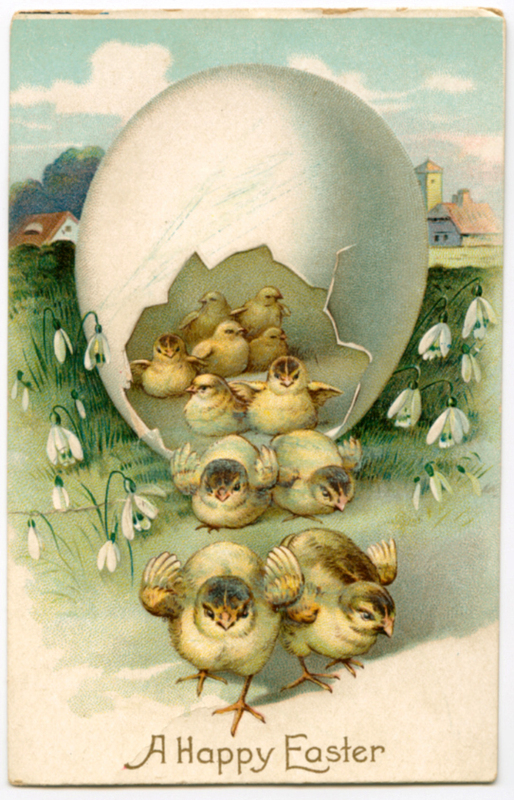 This image comes from a lantern slide and was likely taken by Emily Drew. For a color picture, look here. The clusters of dainty, fragrant pink flowers make a delightful and memorable bouquet. In earlier days, when woods were more abundant and available to children, when traffic passed more slowly, especially on a “Sunday drive,” many a child added to her allowance by gathering Mayflowers and selling the bunches of them at the side of the road. 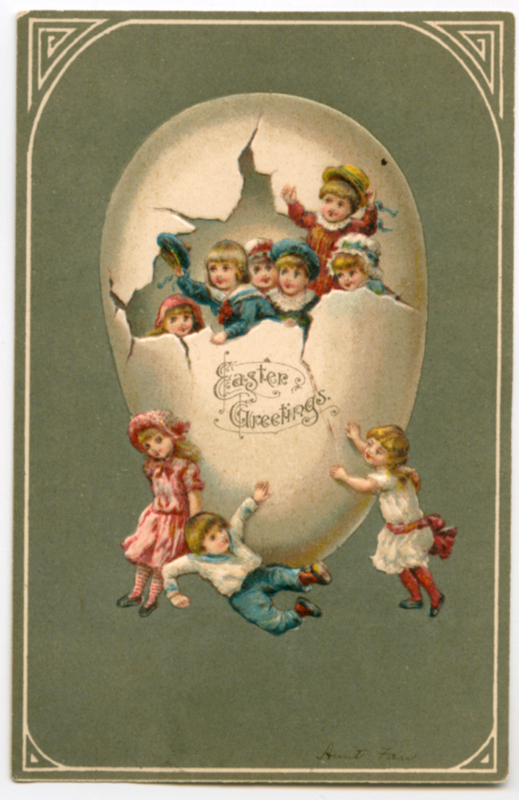 They were also a popular item in the May-Basket one hung on Grandma’s door to surprise her. Have you ever made a bouquet of them? 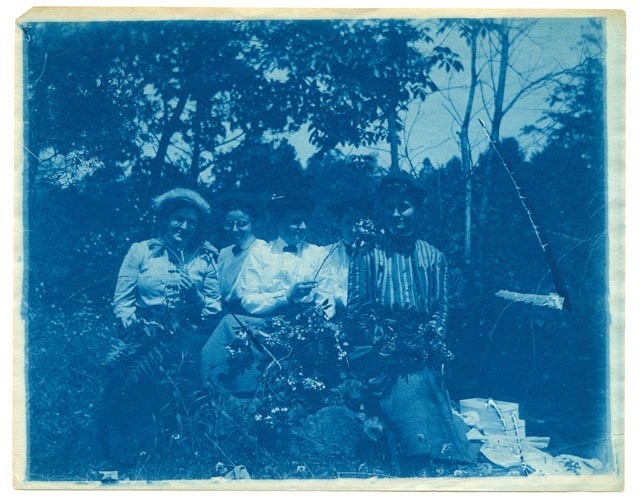 These unidentified ladies in an undated Emily Drew cyanotype might have. On April 12, 1886, workers broke ground for the construction of a reservoir as part of Kingston’s new municipal water system. 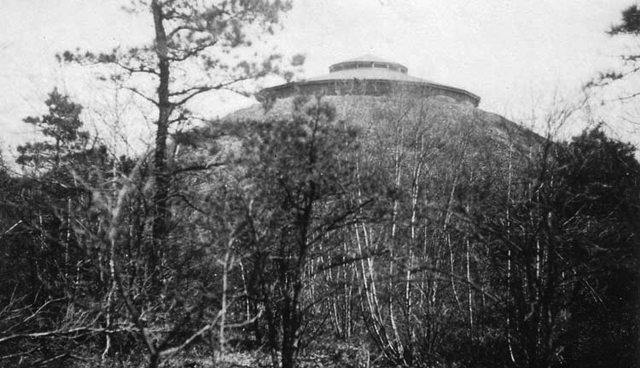 Located just south of Russell Pond off Round Hill Road, the reservoir was used by the Water Department until 1996.
the reservoir is about 47 feet in diameter and 30 feet deep and was originally built of brick but, after several years of service, serious leaks developed in the bottom and a new cement bottom was laid over the original brick, and in 1923 when it was desired to increase the capacity of the reservoir it was completely relined, sides an bottom with 12” of concrete reinforced with steel bars and the new wall was carried to a height of 12 feet above the ground level which increased its capacity to about 400,000 gallons. 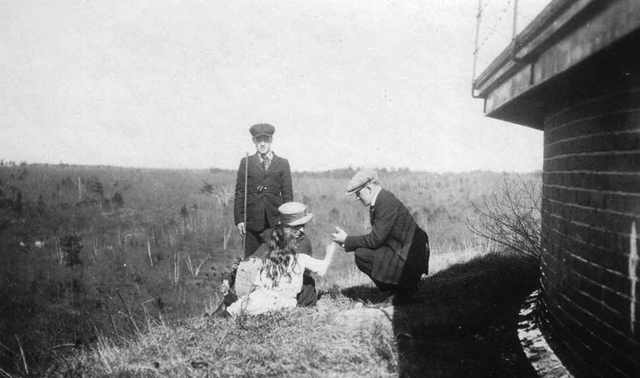 Sometime before the 1923 renovation, Emily Drew photographed members of her family — her brother Clarence, his wife Charity and their children Norma and Bud — at the reservoir. Sources: Vertical File: Water Department; PC14 Kingston Water Department Papers; Through Emily’s Eyes. 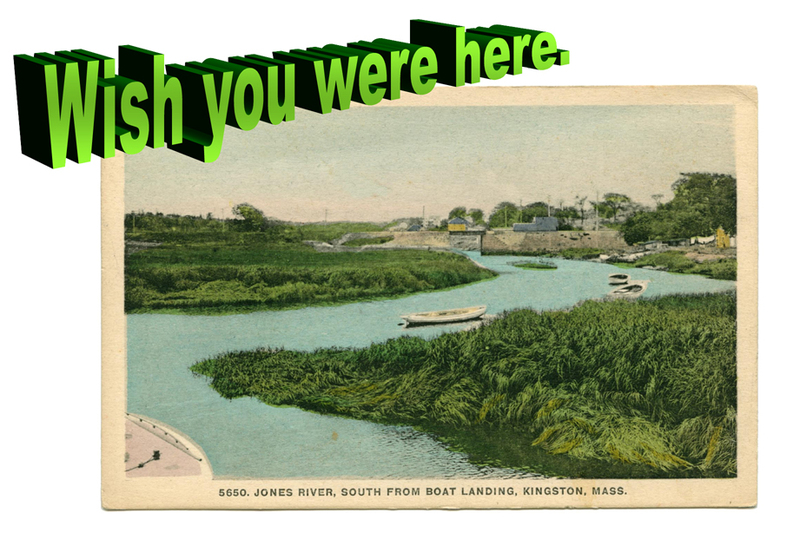 New exhibit: Greetings from Kingston, Mass. 5650. Jones River, South from boat landing, Kingston, Mass. 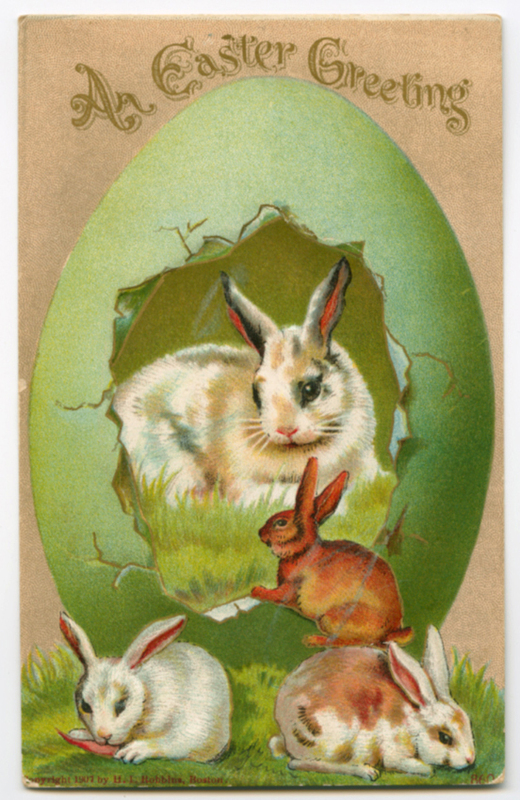 The exhibit for April in the Local History display case is a selection of early 20th century color postcards showing Kingston buildings and places. 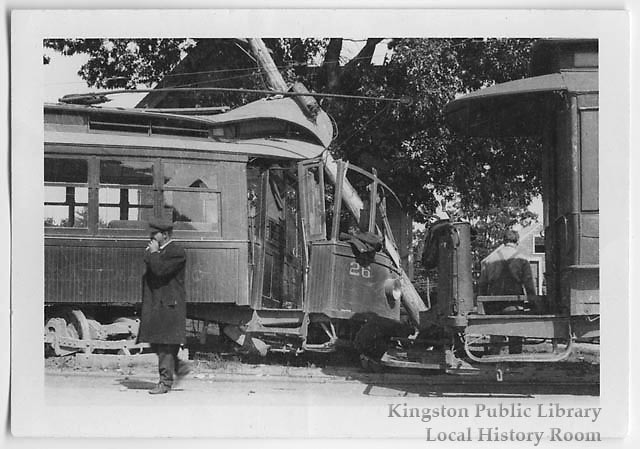 Here are two views of a trolley accident in Kingston from sometime in 1910. 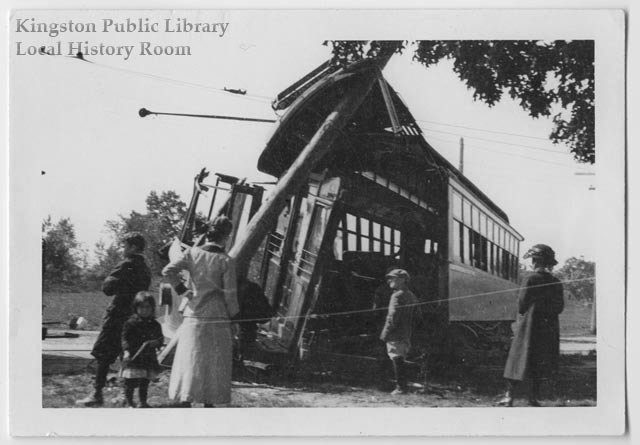 The cars shown here belonged to the Plymouth & Brockton Street Railway Company, which was originally called the Plymouth & Kingston Street Railway. For more information on the company, which still runs buses in the region, visit the history page of their website.